Here in this article, we are going to use the Microsoft Custom Vision AI, which is a cognitive AI service. The Custom Vision service uses the machine learning to classify the images we are uploading. The only thing we are required to do is, just specifying the correct tag for each image, you can also tag thousands of images at a time. The AI algorithm is super powerful to give us better accuracy and once the model is trained, use the same to classify new images according to the needs of your app. The Cognitive Services are always a great topic to consider for writing, especially when there is a mix of Machine Learning. 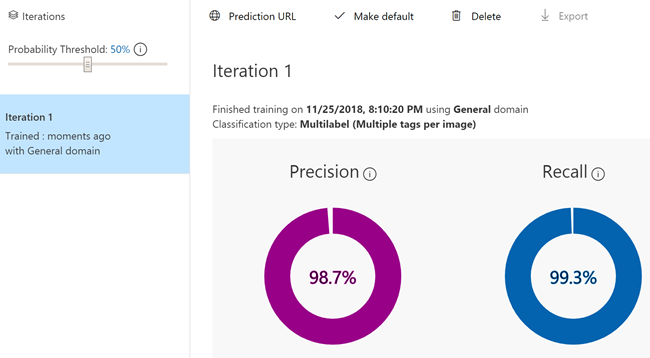 Here, in this article, we are going to use Microsoft Custom Vision AI, a cognitive AI service. With the help of Custom Vision AI, we can easily do the below things. The Custom Vision Service uses machine learning to classify the images we are uploading. The only thing we are required to do is, just specifying the correct tag for each image. 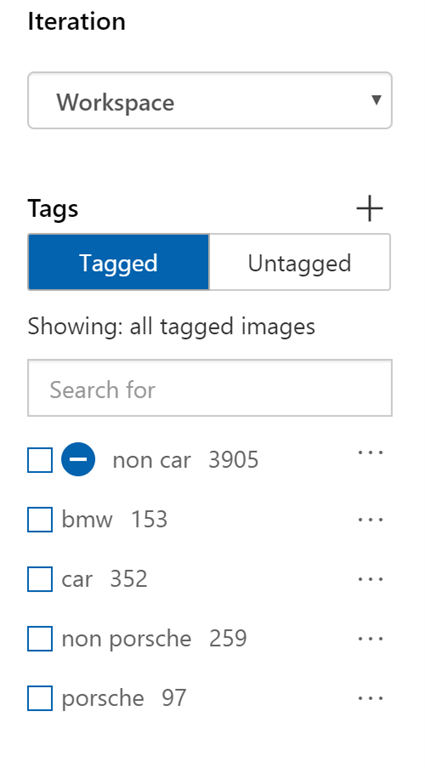 You can also tag thousands of images at a time. The AI algorithm is super powerful to give us better accuracy and once the model is trained, we can use the same to classify new images according to the needs of our app. Let’s skip the introduction and start doing some amazing things. You can always see this article on my blog here. I assume you have already gone through and set up all the prerequisites and followed the instructions. If not, please check again. Once you tag them properly, you can train your model. If everything goes well, you should see an output as below. Please make sure that you are checking the precision. If it is a good number, then you are good to go. 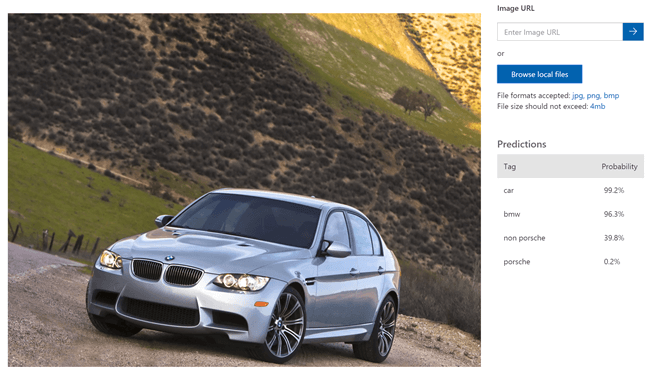 As many images as you can upload and train with the correct tag, the precision value gets increased. So, feel free to add images and see the output yourself. Below is the count of the images which I trained to my model. When you train again with the new data, you can see that a new iteration is getting created which is really handy if you need to go back to the previous state if the precision value is getting decreased. You can also do a quick test with the UI provided. Please click on the Quick Test button and upload an image. 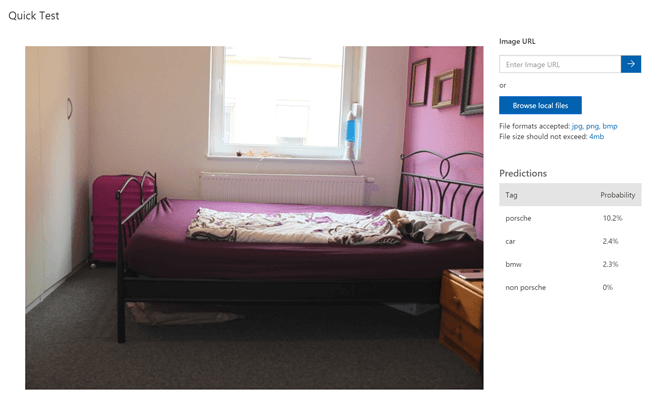 Let’s upload an image of a bedroom. Well, that was easy. Now, let’s upload an image of a Porsche car. Our Custom Vision AI is working as expected. Now, we can go ahead and grab our keys that are needed to create an application to use Custom Vision AI. Please click on the Settings symbol on the right side of the page, and note down your project id and prediction key. You will also need a prediction URL, which you can get from the Performance tab. Is that all? No, in the next article, we will create an application which can be used to test it in real time. Thanks a lot for reading. Did I miss anything that you think should have been in this article? Did you find this post useful? Do not forget to share your feedback. What are you waiting for? Create your model and train.